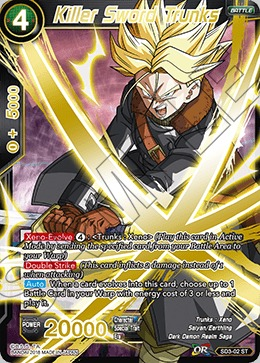 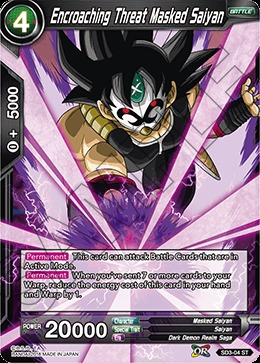 Card Name: Encroaching Threat Masked Saiyan | Card Number: SD3-04 | Character: Masked Saiyan | Color: Black | Combo Energy: 0 | Combo Power: 5000 | Condition: | Energy(Color Cost): 4(-) | Era: Dark Demon Realm Saga | Power: 20000 | Rarity: ST | Set Name: Series 3 Starter: The Dark Invasion | Skill: [Permanent] This card can attack Battle Cards that are in Active Mode. 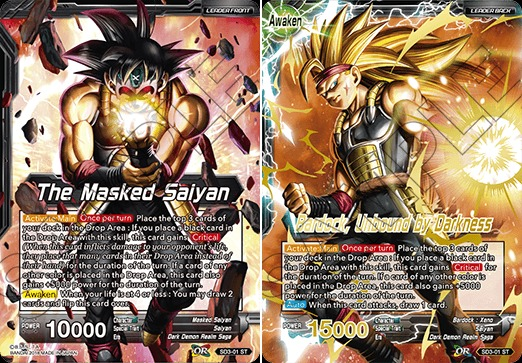 Card Name: The Masked Saiyan // Bardock, Unbound by Darkness | Card Number: SD3-01 | Character: Masked Saiyan | Color: Black | Combo Energy: | Combo Power: | Condition: | Energy(Color Cost): | Era: Dark Demon Realm Saga | Power: 10000 // 15000 | Rarity: ST | Set Name: Series 3 Starter: The Dark Invasion | Skill: [Activate:Main][Once per turn] Place the top 3 cards of your deck in the Drop Area : If you place a black card in the Drop Area with this skill, this card gains [Critical] (When this card inflicts damage to your opponent's life, they place that many cards in their Drop Area instead of their hand) for the duration of the turn. 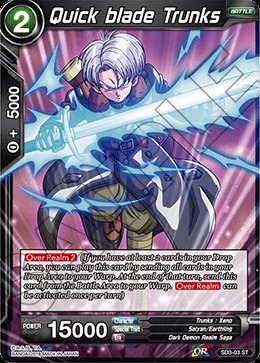 If a card of any other color is placed in the Drop Area, this card also gains +5000 power for the duration of the turn. 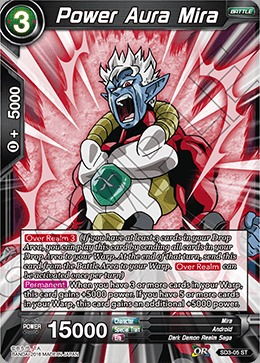 [Awaken]When your life is at 4 or less : You may draw 2 cards and flip this card over.